The idea is that after death your consciousness will be exactly like your consciousness before death. Maybe it will be a little bit more sensitive and clearer, so if you make your life now kinder, more compassionate and wiser, and you don’t react with negative emotions and negative reactions, you become wiser, you have more reason and right way of seeing things then you have no problem after death. That’s the idea. That is why the state of mind is so important, that you focus your mind on the positive things. And if you can do that now, and you can do it at the time of death then there is no problem. In short, preparation for death and the preparation for life is the same thing. They say that a little bit of knowing about the process of dying. That knowing about this kind of process, there is change and for every change there is an opportunity. Usually we say that, in the life we are in now, our mind is very busy, very occupied by lots of things in life, all kinds of life’s activities, and when you die, they say, that your gross mind kind of dissolves. This means like all your thoughts, all your emotions dissolve for a while, and you go into the deepest level of your consciousness. If at that moment, when you are in the deepest level of your consciousness, if you can experience that, then they say that you have actually come to clearly experience Buddha nature, your true nature. So if you can experience that, then you have no further problems, you are enlightened. So that is one very big opportunity, but in order to do that you need to have some training, some experience now. They say that from a Buddhist point of view, lots of people who meditate and practise now don’t get the whole experience of enlightenment now, but will get it at the time of death. Because at the time of death you can actually get to that experience and you need to recognise it. Then it is said that, if you don’t get the experience at that time or if you don’t recognise it at that time and if you miss that chance, then again you start to come back to our usual kind of consciousness and then you will see lots of different things, different forms, different lights, different sounds. Sometimes you get very frightened or very attracted to all that. At that time, if we have some experience or understanding now, then we know that all these are my own mental manifestations. It’s not something out there that I have to be afraid of, or try to catch. If you do recognise this very clearly, then you can relax in that. You can relax in that again, then you can be really, completely at peace. You are also kind of enlightened, and you have no problem. That’s the idea, that’s another opportunity. You you have to find that you are actually dead. You look in the mirror and if you don’t have your reflection then you know that you are dead. It is said that at that time you sometimes get lots of fear and panic. You should not do that, ‘now I’m dead and have no body. Whatever I think, I’m there, New York, I’m there. If I think about Sikkim, I’m immediately there. You’re there and at that time you can see lots of relatives and friends, you can see their minds, and sometimes people have not good thoughts, pretending to be nice and then you get really angry and upset and things like that – you should not do all that. Rough transcription and editing of part of a talk by Ringu Tulku Rinpoche. 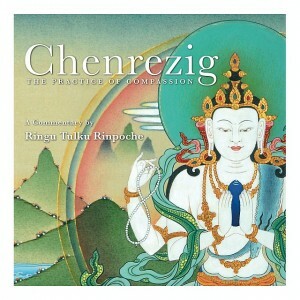 Thank you for this very helpful summary of Rinpoche’s remarks on dying and the bardo state. He makes it all less frightening and more plausible. I appreciate this a lot.